PokerStars offers three types of bonus codes. The PokerStars Deposit Bonus code is an ongoing bonus available for new players. Occasionally there will be active PokerStars Reload Bonus Codes and PokerStars No Deposit Codes. Check the appropriate section below for current PokerStars Bonus Codes. 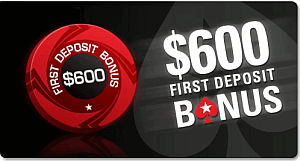 Use PokerStars first deposit bonus code STARS600 to get a 100% up to $600 sign up bonus. When you sign-up for your new PokerStars account make sure to enter the marketing code rakeback.com when prompted to have access to Rakeback.com’s exclusive money added promotions and freerolls. When you use one of the PokerStars Bonus codes below you need to earn the following amount of VPPs to clear bonuses. Bonuses are cleared in increments of 10 (USD, EUR, GBP, CAD). The number of times a PokerStars Bonus code is available to each player varies depending on the bonus code type. The length of time to clear bonuses also varies on the PokerStars Bonus Code chosen. There are no current PokerStars Reload Bonus Codes. There are no current PokerStars No Deposit Codes.